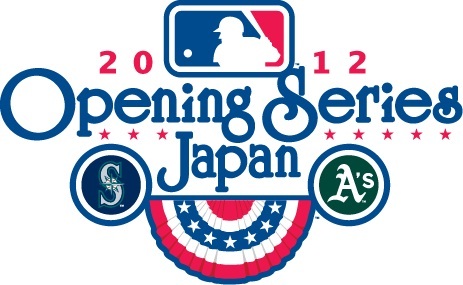 Japan Opening Series 2012: Baseball is Back! Ichiro Suzuki gets the first hit of the 2012 MLB Season. He went 4-5 on Opening Day, tying Ken Griffey Jr's Mariners franchise record for hits on Opening Day. 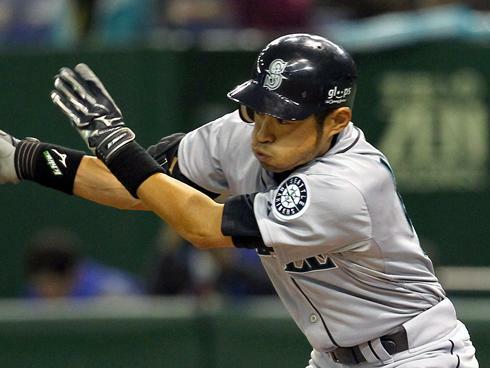 The 2012 MLB season officially began this morning in Tokyo, Japan with the Seattle Mariners defeating the Oakland Athletics 3-1 in 11 innings. This was a record day for the countryman, Ichiro Suzuki, who finished 4-5 and tied Ken Griffey Jr’s franchise record for Opening Day hits set in 1990. Dustin Ackley also provided fireworks for the Mariners including a home run and and a go-ahead single in the 11th inning which was more than enough to cement the victory for the M’s in the first game of the Japan Opening Series 2012. Felix Hernandez pitched 8 strong innings only allowing one earned run on 5 hits while striking out six, and relievers Tom Wilhelmsen and Brandon League shut out Oakland’s bats over the final three innings to preserve the win. While both the Mariners and Athletics will return to Arizona to finish off their Cactus League spring training season after tomorrow’s game, both today’s contest and the affair tomorrow morning will count in the regular season standings. The Japan Opening Series is an attempt by Major League Baseball to expand the global reach of baseball and of the league while showcasing some of its star athletes to fans outside the United States. International play began in 1999 when the Rockies and Padres opened the season with a game in Monterrey, Mexico, the first game ever played outside the United States and Canada. A year later the first game in this Japan series was born with the Cubs and Mets opening the 2000 season at the Tokyo Dome. Major League Baseball had planned to start the 2003 season in Japan also but that game was cancelled after the start of the Iraq war. In 2004 the Japan Opening Series returned with the Yankees starting off their season against the Devil Rays, in a series where Hideki Matsui became the first Japanese-born player to return to Japan for an official Major League Baseball game. Four years after that the Oakland A’s made their first trip to Japan to face off against the defending World Series Champion Boston Red Sox, in a special game where Diasuke Matsuzaka took the mound on Opening Day and helped the Sox to a 6-5 win. And that leads us to today, where the Mariners and the A’s face off and Ichiro Suzuki is the main attraction. Also on the Mariners roster for their first Major League seasons are pitcher Hisashi Iwakuma and infielder Munenori Kawasaki, two Japanese-born players who did not make it into the line-up today. This morning was the latest iteration of the Japan Opening Series which started in the 2000 season. Unlike the National Football League who also has recently began playing games outside the United States, Major League Baseball and the sport of baseball itself already have a following outside North American borders. Fans that came to the Tokyo Dome today came to see Ichiro Suzuki and his Mariners but it’s not the first time they’ve seen him. He played nine years with the Orix Blue Wave in Japan’s Pacific League before coming to the United States prior to the 2001 season. He already has a huge following in Japan, where about 70% of MLB’s international revenues are derived, and that certainly makes the game a more attractive draw for our foreign friends than American Football is to the British. It seems like the Japan Opening Series is here to stay, and while it does seem kind of weird to open a baseball season with games half a world away, I for one am just happy that meaningful baseball games are back on the docket. This entry was posted in MLB and tagged Athletics, Baseball, Japan, Mariners, MLB, Tokyo Dome. Bookmark the permalink. ← Happy Birthday Buster Posey!